Deliver packages, carry passengers, zoom through the air, or save the day, with the My First Vehicles set! 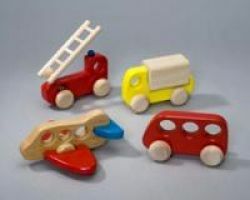 Made of natural wood with bright, cheerful paint finishing and moveable wheels, they're eye-catching and fun to play with. Vehicles measure 5 1/2" by 6" by 2 1/2"